Prior to being a full-time artist Tut worked as a graphic designer for 20 years, now, Tut is living her dream of being a full-time artist by putting her talent and experience in the design world to use. Colour remains an interest to Tut as it is something that can trigger emotive responses along with an ability to represent a time of day. Tut’s consideration and attention to harmony is present in every aspect of her work, from size of canvas to how she chooses colour and applies it. 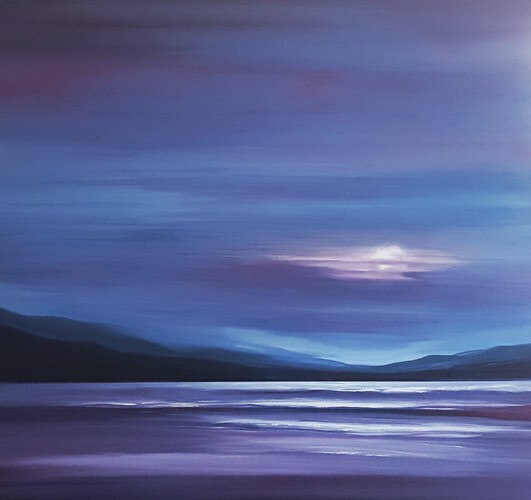 Another aspect of what makes Tut’s paintings so captivating is how she uses colours to radiate off and blend into each other, creating a magical atmospheric painting. Her paintings allow the mind of the viewer to drift into them, taking the viewer to a place where there is a warm sunrise that is taking over the night sky, where the pink clouds are being reflected in the sea’s surface, transforming the water to appear as a never-ending supply of strawberry cream. Through an abstraction of the sea or landscape, Tut’s decision to remove details draws attention to what is important to her and what aspects she wants to share. 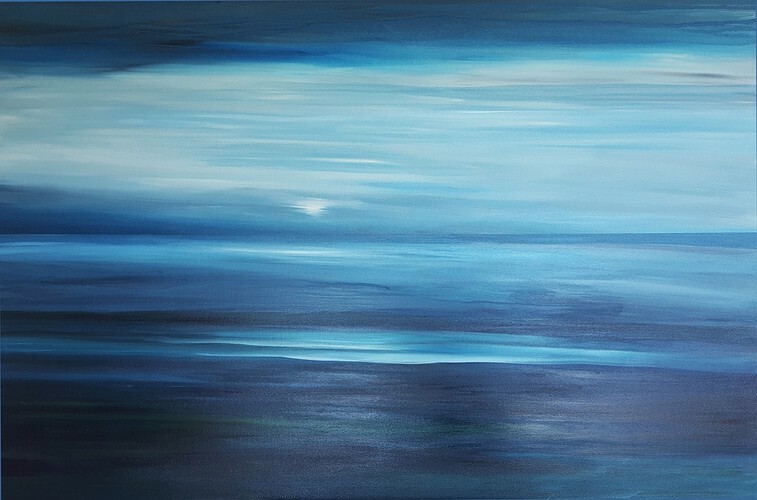 Instead of the viewer being caught up in the details of the sea or landscape, they are captivated by the ‘essence’ which is triggered through her use of colour. The size, seamless application and blend of tones and colours make a positive and peaceful impact wherever placed, making them the perfect addition to the home or workplace. Painting is my passion. I use my art to explore and express my emotions and moods. This gives me the freedom to create for my enjoyment and the enjoyment of others, adding depth to my art as it captures the passion and expression of myself and nature. Living in New Zealand I am constantly struck by the beauty and variety of nature and scenery. Every day I feel privileged to live in a place that has such extraordinary landscapes and atmosphere. I use it as a base to empower and drive the creativity in my paintings. It fuels my passion to have the chance to share it with the world through my work. My recent pieces take inspiration from the views around me. 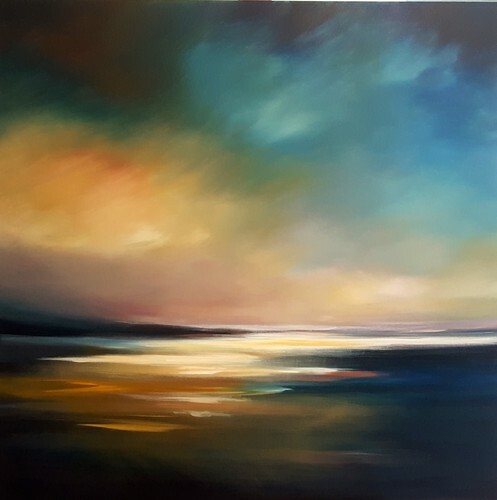 Using an acrylic medium, I create abstract landscapes exploring the relationships and contradictions in nature by presenting dramatic contrasts between light and dark. visualize the movement of the wind, waves, and clouds with an emphasis on a particular day or a season. Instead of showing small details, I use the blending of large and small marks in contrasting directions, shades and gradations to create a sense of atmosphere and feeling, bringing the viewer into the emotion and feeling of the moment captured. In my paintings I challenge the observer to feel the breeze, the chill in the air; to feel that they are inside the moment, drawing the viewer inward to have an encounter with the nature of the place and time, while striving to capture a glimpse of the beauty, awe and wonder of this world.